I have a confession. I own a mini museum of Worlds Fair Memorabilia. Not only do I follow the crows around my neighborhood but I also seek out those kitschy things that were made years ago for Worlds Fairs. 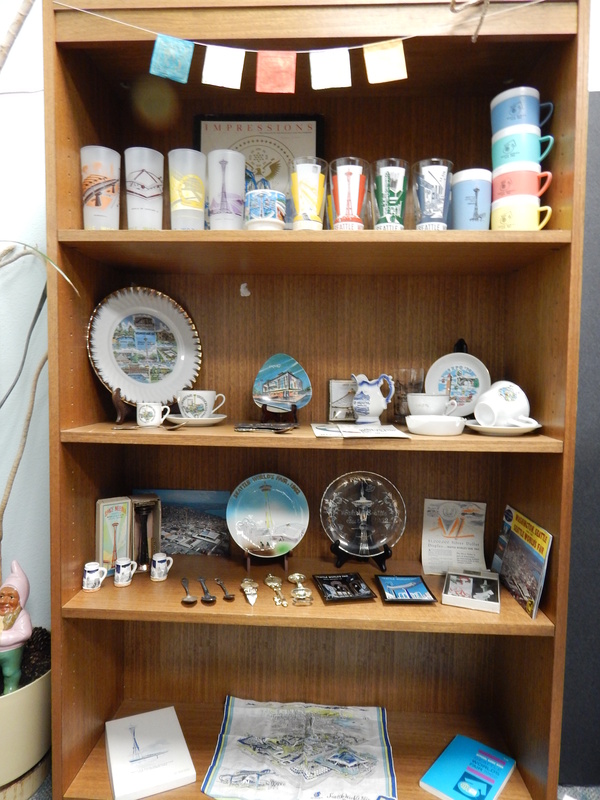 They range from ashtrays, teacups, plastic pens, bottle openers, Jim Beam decanters shaped like a space needle and of course all the pamphlets and guide books. I found a very cool blog post about another person whose husband had a Seattle Worlds Fair Mini Museum too. That rang so true to me that I realize that is what my collection is. It is in the mini museum realm too. This year I cleared out all the old binders during our record retention pack rat clean up day and put my cool items all in the book shelf. Thus my museum became more than a pile on top of a lateral file cabinet. So, kudos to Left Coast Cook and the post Century 21 Redux. And now I get to shamelessly promote my other blog When the World was Fair. Which is all about my Mini Worlds Fair Museum.